What's Ahead for Rep. Dennis Kucinich? What’s Ahead for Rep. Dennis Kucinich? Dennis Kucinich, the liberal icon who tried twice to get the Democratic nomination for president, in Lorain, Ohio, January 1, 2012. In a newly drawn district in Ohio, outspoken antiwar Rep. Dennis Kucinich suffered a defeat against Rep. Marcy Kaptur. The two were forced to square off in a Democratic primary after Republicans redrew Ohio’s congressional map. Kaptur now faces Samuel Wurzelbacher, “Joe the Plumber,” winner of the district’s Republican primary. Kucinich has said he may establish residency in Washington state, where there is a June filing deadline to run for a new congressional seat in the Seattle area.“I think there would be an awfully lot of people, even on the ground in Washington state, who would be more welcoming to him than to most candidates,” says reporter John Nichols of The Nation. AMY GOODMAN: I wanted to turn to another of the races that hasn’t got as much attention. But this is Dennis Kucinich, the race between Dennis Kucinich and Marcy Kaptur in a redrawn district in Ohio. The significance of Marcy Kaptur’s victory? And now she’s going to be up against the man who won the Republican primary, the man who most of America knows as “Joe the Plumber.” John Nichols? JOHN NICHOLS: Sure. It’s an overwhelmingly Democratic district, so at the end of the day the likelihood is that whoever won this primary was going to go on to win. And I think Marcy Kaptur will beat Joe the Plumber, probably with relative ease. But the primary contest was in many ways a heartbreaking one, because you have very few people in Congress who are willing to stand up and say bold things on core economic issues and on issues of war and peace. And so, what Republican remapping folks, the redistricting commission in Ohio, did was jam together two very Democratic districts and take two of the more, I’d say, independent and outspoken Democrats in the Congress, put them together in the same seat, and force them to fight it out. Kaptur won not because Dennis Kucinich is a bad guy or somehow the people turned against him, but because the district at least marginally favored her. It was more of her turf than Dennis Kucinich’s turf. But it was a—it was a rough primary. They fought with each other very hard. AMY GOODMAN: —the question is, will he be lost? AMY GOODMAN: —I actually bumped into Congress Member Kucinich and talked to him about why he was there in the state of Washington. 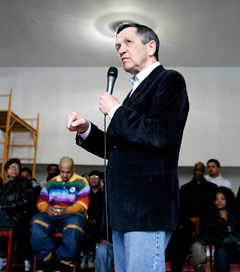 AMY GOODMAN: And so, the question is whether Congress Member Kucinich would establish residency in Washington state, although wouldn’t that be difficult, as he still represents the people of Cleveland in Congress, John Nichols? JOHN NICHOLS: Yes, he would have to step down to change his residency, if I understand it correctly. But he does have time to do it. The Washington state primary is very, very late. And so, the filing deadline for running in this new seat in Washington state in the Seattle area is not until June. And so, Senator—or Congressman Kucinich could make this move. It’s very, very hard, having run for a seat in one state, to then jump to another state and say you want to make a try there. This is much more of a European model. In England, for instance, something like that might happen quite commonly, because under their parliamentary system, members often represent areas that they’re not from. In America, we have much more of a tradition of sort of locally rooted candidates. And so, I think it would be a very tough jump. By the same token, as I was saying before, I think losing Dennis Kucinich, with his outspoken antiwar stances and also his sort of rapid response on so many issues—he’s usually the quickest member to be up and running with a progressive response to economic issues at home as well as foreign policy, very willing to challenge Democratic presidents and Democratic leaders when they’re wrong—I think there would be an awfully lot of people, even on the ground in Washington state, who would be more welcoming to him than to most candidates. So I think it’s within the realm of possibility, but I cannot emphasize to you that it is a hard, hard leap, something relatively unprecedented. AMY GOODMAN: And, of course, he opposed the intervention in Libya, and with the war talk around Iran, a very significant voice, antiwar voice, in the Congress.